Whether you like to drink Hobgoblin, Meantime or Atom Splitter, Waitrose has a surprising number of real ales, stouts, beers and lagers. We place a great emphasis on supporting local and regional suppliers. We now offer over 300 beers from England, Wales and Scotland through our 'Locally Produced' initiative and an increasing number of branches stock a selection of beers brewed within a 30 mile radius. The trend for artisan beers is becoming increasingly popular, and small breweries are experimenting with styles and flavours to create fun and interesting drinks for a more personal drinking experience at home. There are more than 20 craft beers available at Waitrose, from honey-coloured Belgian blondes to warming, ruby red oak aged cask creations. "As an independent consumer organisation we are continually campaigning for greater appreciation of traditional beers and ciders. Waitrose support of small breweries will help ensure that more locally produced British beer is available for people to enjoy, and that the industry continues to thrive." Owen Morris from CAMRA (The Campaign for Real Ale). Dhruv Baker visits Thornbridge brewery in Derbyshire to discover how real ale is made and how to serve it with food. 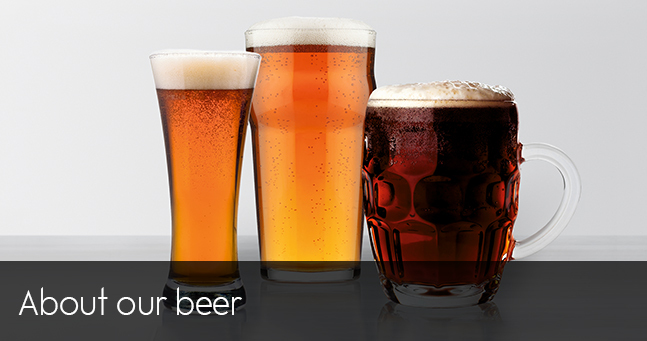 Like wine, there are beers to complement certain foods as our quick guide below shows. 'India Pale Ale' was originally brewed for export to expatriates in the Indian empire in the 1700s and was made to a higher strength and with more hops to help it withstand the long, hot journey. It has an increased bitterness compared to normal pale ale, but like most beers it is a good match with many foods, especially Indian cuisine and is an excellent choice with a curry. A mainstay for British beer drinkers since medieval times, bitter is a well-hopped English ale which derives its name from the bitterness given to it by the hops. Generally a mid-brown colour, it is made in three grades, with stronger versions usually known as 'Best' or, stronger still, 'Special' or 'Premium'. Although usually enjoyed on its own, why not try a pint with a traditional Sunday lunch of roast beef and Yorkshire pudding? Golden ales are premium ales which are typically lighter in colour and are wonderfully refreshing. A hoppy taste, with a fruity aroma and bitterness on the finish, it can be served with food as an alternative to a glass of white wine - try it with roast pork or chicken. Serve chilled for maximum enjoyment. Blonde beer is a more contemporary style, with a European slant. Another refreshing drink, this time achieved with the help of imported hops and sometimes with the addition of citrus flavours. Unlike Belgian wheat beers, blonde beers are clear, not cloudy, with a light gold colour. It's also particularly good at mealtimes, matching well with seafood. Serve chilled. Usually 5% or more alcohol by volume (abv), strong ales tend to be heavier in style and hence are most welcome during the winter months. Each one has its own flavour characteristics, with varying proportions of fruit, malt, sweetness and bitterness. Hearty British dishes taste even better when served with a glass of strong ale. Try a glass with stews, casseroles or game dishes as well as mature Cheddar or Stilton. Porter - an unusual accompaniment to Christmas pud! Invented in 1722, Porter was originally a blend of three beers: hopped, unhopped and strong ale. It has a deep brown colour as a result of the grains being burned black during malting. Regarded by many as a halfway house between bitter and stout, it's superb when served with food. The rich, fruity flavours of porter make it an unusual but excellent match for Christmas Pudding; alternatively its bitterness provides the perfect contrast to oysters - this has to be tried to be believed! Unlike other bottled beers, they are unpasteurised and contain live yeast for a slow secondary fermentation in the bottle. The yeast also gives the beer natural effervescence and leaves a little sediment in the bottom of each bottle. Bottle-conditioned beer is a living product and will go on to develop further complexity as it matures in the bottle. To enjoy at their best, store upright in a dark place, serve lightly chilled (about half an hour in the fridge) and take care when pouring, leaving the sediment behind in the bottle. Savour their wonderfully fresh flavours on their own or enjoy with food. Organic beer is brewed from barley and hops which have been organically produced and certified by the Soil Association. Organic hops tend to have a stronger and more distinctive aroma which reflects in the finished product. And of course organic beer is an ideal partner for organic food! Please note that under the Licensing Act 2003, it is an offence to purchase or attempt to purchase alcoholic liquor if you are under the age of 18.